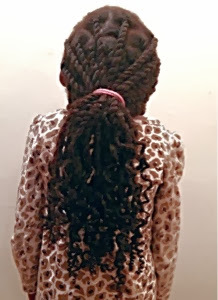 So I had to re twist the little one's hair because her ends were coming loose. I was not comfortable with the initial result because I did not pull the hair enough. 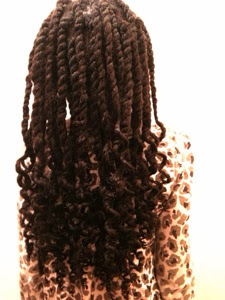 When you are installing Havana Twists, you must have tapered ends to make the ends stay put, otherwise the hair would be too thick to "seal". So what I did was use the same hair but had the hair elongated, so that it doubled in length. The very ends were made thin to make sealing easier. I used pieces of yarn to wrap the ends spirally, but pushed each wrapped section up as I wrap along the length. 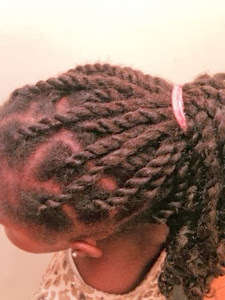 This method is called the corkscrew method and believe me when I say it is far better using this method to get curly ends than using those perm rods. I loooove the results and again I hope these last for at least three weeks. I like that you made the parts nice and big. 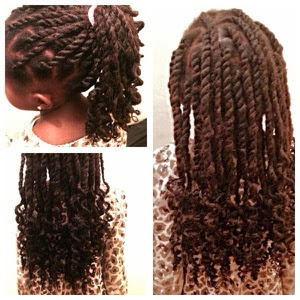 It looks like you're taking care not to stress your baby's edges or add too much weight with a lot of extra hair. Thank you. 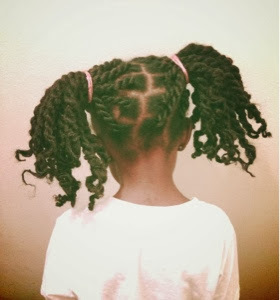 Choosing this size was the best option for her hair in terms of protecting her edges and putting less stress that smaller twists would encourage.